If you are an EPEL user (for whatever operating system), a packager, an upstream project member who wants to see your software in EPEL, a hardware enthusiast wanting to see builds for your favorite architecture, etc. … you are welcome to join us. We’ll have plenty of time for questions and issues from the audience. The trick is that EPEL is useful or crucial for a number of the projects now releasing on top of CentOS via the special interest group process (SIGs provide their community newer software on the slow-and-steady CentOS Linux.) This means EPEL is essential for work happening inside of the CentOS Project, but it remains a third-party repository. Figuring out all of the details of working together across the Fedora and CentOS projects is important for both communities. Recently I’ve begun volunteering at Idea Fab Labs here in Santa Cruz, with two specific goals — expanding the space to include free/open source software ethos and hacking, and helping all these awesome makers with questions and reality around the open source way. Tip — I got quite fired-up to do this from Ruth Suehle’s keynote at SCALE this year, so go watch that if you need any reason why you should be helping maker spaces and friends with your open sourcery. On the first goal, I’m working up a space in the fab labs — similar to the 3D printing, CNC router, laser cutter, jewelry zone, electronics, etc. spaces — goal is to have a place to drop in and do real software hacking; teach others from the bottom all the way up on how and why to contribute; or, yeah, even freaking care about open source software. Tip — if you live in the 21st century and care about the progress of technology, you should freaking care. What do you think of these topic ideas as a way to introduce free/open source software to a local community that is technical, maker-oriented, but full of questions? “What is open source?” — Basic explanation of what free/open source software is for all audiences. “How do I fix this open source thing?” — You are using free/open source software in some way and have discovered something you wish to fix, report, or comment on, but … how do you do that? 1 hour class covers basics in 15 minutes, then dives in to two or three specific projects as examples. “What are open source alternatives to My Favorite Software?” — You have some reason you MUST use N software from M vendor, but maybe something else will work as well? “How do I use X open source software to accomplish Y?” — You want to learn how a specific tool such as GIMP, Inkscape, Blender, Krita, LibreOffice (OpenOffice), etc., might work for your need. “Open source and your business – practical answers to practical questions” — You are wondering how people make money on this ‘free’ stuff. AKA, no-cost does not mean no-money. “Avoiding open washing — following the open source way beyond software” — Open movements are everywhere, but are they all equal and give the same essential freedoms as free/open source software? “How do I start an open source-like contribution community?” — You are ready to start a project of some kind, such as software but maybe maker-CAD-files or farm equipment or whatever. Practical step-by-step guide to be successful. Thanks for your thoughts, my local peeps in Santa Cruz will really benefit. 🙂 Of course, all materials I write will be released under a Creative Commons license as part of The Open Source Way. You may want to read more about sauerkraut and lactic-acid fermentation, as well as about kimchi itself. It’s really fascinating. One tip I have is that I choose not to “backsplash”, which is the term I’ve heard for the practice of pouring some of the liquid from an existing fermentation in to the new fermentation. Some people do this by using the fermented whey they get from hanging yogurt. I’ve found that I don’t like the texture and flavor when the fermentation is cut short in that way. In lactic-acid fermentation, there are several stages of fermentation that can only occur when you work up from just raw vegetables and salt. Backsplashing results in jumping ahead to the later fermentation stages. However, I often to backslpash after the fermentation is complete, so as to carry on the microbiotic benefits of the previous generation. In this recipe I’m going to specify things by a single unit — one head of cabbage, one carrot, etc. My usual recipe would be about a 4x to 6x of the below, which would make about 1.5 or 2 gallons. The challenge is that a cabbage head or an onion is not a consistent size, so you have to gird your loins a bit and make some guesstimates in the end. That is, it’s not a cake recipe measured by weight at sea level in the south of France. I usually make mine without fish or soy sauce so that it appeals to the widest diets, but for my own personal kimchi I put in lots of fish sauce. Tip: wait to put these ingredients in until after the main lactic-acid fermentation is pretty complete, as fish and soy sauce are both fermentations and may change the fermentation process. Start by cutting napa cabbage into squares roughly 1/2″ x 1/2″ (1cm x 1cm), larger for the greener parts is fine. Put in large stainless steel or glass bowl. Throw in salt, mix and mash and squeeze and mix to get the salt to integrate with the cabbage and start pulling water from the cabbage. Let sit while you work the rest of the ingredients. Smash the ginger with the side of a knife to pound the fibers flat, then coarsely chop and put in a food processor. Do the same with the garlic and turmeric. There is no need to peel the ginger or turmeric (but definitely peel the garlic.) Pulse in the food processor until finely chopped. (You can do all this by hand if you prefer … sore hands.) Dump contents in to the bowl of cabbage, scraping the food processor with a rubber/silicone spatula. Grate carrot on largest setting. I actually prefer a fine matchstick size from a vegetable mandoline, but you may use a cheese grater as long as you get the size up to pretty big. If your carrot is shredded fine it will dissolve too easily, become mushy quickly, and never be a nice crunchy pickle texture. Cut both ends off the onion and peel, then slice in half from one end to the other. This leaves the fibers mainly intact so the juices remain in each sliver. Set the onion cut-side down, then cut half moon slivers working over the arc of the onion. (This WikiHow onion cutting techniques article has a good example as method one “Slice”.) Put the slices in the bowl with the cabbage. Don’t worry if you cut the wrong way or too large, it will work fine just be crunchier or softer in the end depending. Toss in the chili powder mix. Mix and smash and squeeze and pound and mix and mix. Mix some more. The more work you do here, the faster it will give out liquid, which helps you get a more compact (less dilute) brine. It should be ready to put in the fridge between day 4 and day 7, depending on your weather conditions. I’ve never found that I need to “bury it in the ground for six months”, but I can see how letting it ferment more slowly (such as in a cool basement/cellar) would help it keep longer without refrigeration. Try variations of adding in about 20% other leafy green, such as kale or my favorite, Chinese mustard greens. Although some people in open source communities might not be aware of him, Paul Cormier holds a singular position in the open source world. This hinges on the detail that Red Hat is the longest standing and most successful company at promoting the growth of free/open source software and especially the acceptance of that software in the enterprise (large businesses.) Paul is a Red Hat EVP, but he is also the President of Products and Technologies, meaning he is ultimately accountable for what Red Hat does in creating products the open source way. Paul has held this position essentially for the last dozen years, and so has overseen everything in Red Hat from the creation of Fedora Linux to the rise of cloud computing that Red Hat is an intimate part of. In other words, when Paul C. speaks — keynote or in-person — he is someone really worth paying close attention to. In this post on Red Hat’s open source community website, “One Year Later: Paul Cormier on Red Hat and the CentOS Project“, I provide some introduction and background around a video interview Paul did with ServerWatch about the Red Hat and CentOS Project relationship. If you are in Florida or in Orlando attending Fossetcon next week, come over to our next CentOS Dojo on Thursday 11 September (all day). Jim Perrin (@BitIntegrity) will start the day with a few minutes about the CentOS Project and do some introductions around the room. Garrett Honeycutt (@learnpuppet) goes next with a session, “Why Automation is Important” that covers topics such as configuration management with Puppet, Ansible, et al. Dmitri Pal from the FreeIPA project will discuss “Active Directory Integration”, a popular topic for many sysadmins and ops people stuck with a mixed-in-with-Windows environment. Greg Sheremeta (@gregsheremeta) of the oVirt project finishes with a tutorial on using the oVirt all-in-one installer. oVirt is virtualization management around KVM (cf. VMWare vSphere) with a growing userbase. Then a sponsored lunch and time to network with your fellow Dojo attendees. After lunch until the evening is a hackfest focusing on building and using Docker, building Xen components for CentOS 6, and whatever else gets cooked up. The CentOS team will be bringing a local mirror and WiFi for connecting on a private LAN for the hackfest. You can bring your laptop, ideas, and skills. If you are interested in attending, please sign up on our event page. I was curious how the discussion rate on centos-devel compared to previous time periods. I want to know if our work on growing the project participation at the contributor level is working, and while examples such as the increase in the SIG activity are a good indication, one simple one is to see if there is more discussion in the contributor communication channels. Based on what I see, the trend looks very good. To make this chart, I simply grabbed all the sizes of the mail archives from the centos-devel archive page and dropped them in to a spreadsheet. Discussion level on centos-devel over last decade. My analysis is pretty simple. There have been other periods of time where the discussion level was this high (above 50 KB in archive size), but they appear more to be spikes than sustained discussion, with the exception of November 2010 through July 2011. If you were around the Project during that time, you know that is a reflection of work and associated noise around the CentOS 6 release. Although the sustained discussion levels are similar, I think the tone of the discussions is quite different, so I weigh the current trend as “good” by comparison because it reflects growing participation rather than concern about the timing of the CentOS 6 release. The one largest-spike-of-all-time is January 2014, which is easily attributable to the announcement about joining forces with Red Hat and the subsequent discussions. 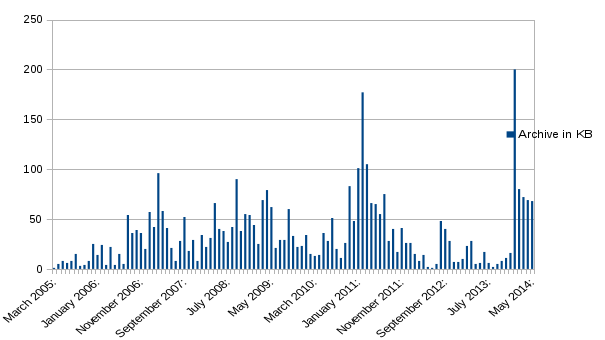 Again, the tone of those emails was quite good, as compared to the previously largest spike of February 2011. That spike was to be expected since the news caught many people by surprise, so I’m generally ignoring it as an outlying data point in terms of having any more meaning than that. Many of us use consensus-style decision making in our free/open source projects such as Apache’s lazy consensus model, but often we have a practice or even a governance of having things end up in a majority-wins voting process. In a majority-wins voting model, the dynamic is one where the dissenters are marginalized — the majority has to put the dissenting minority in the position of being a “loser” in a vote. In a consensus-decision model with blocking, you have a situation where it becomes the duty of the entire group to take care of the dissenters’ concerns. In general, consensus decisions force the group to focus on a compromise around the best-possible solution. When people are in the position of being a winner or a loser, the effect is to make people solidify around one of two extremes that may not represent the best possible solution. Often achieving consensus only requires clarification of a misunderstanding or minor adjustments to the original proposal. This occurs even where no one has blocked, but the appearance of -0 (or a stand aside) will also make it clear that the original proposal might need more thought — getting a -0 from a leading thinker in a group spurs others to wonder if maybe there is more that can be done to make the proposal fully supported. In writing the original section of The Open Source Way, I didn’t go so far as to recommend the abandonment of the majority-wins voting method, instead I said, “Seek consensus — use voting as a last resort.” That section (unfinished) is now going to get a rewrite where I’ll definitely come down against majority-wins, and write out more of the why. Partially I owe my improved understanding from using the consensus model in a business collective where I’m a partner, Santa Cruz Pedicab. Working with the model in the physical world made me intensely aware of the human impact of majority-wins by comparison, and convinced me it was really the backbone to a welcoming community.